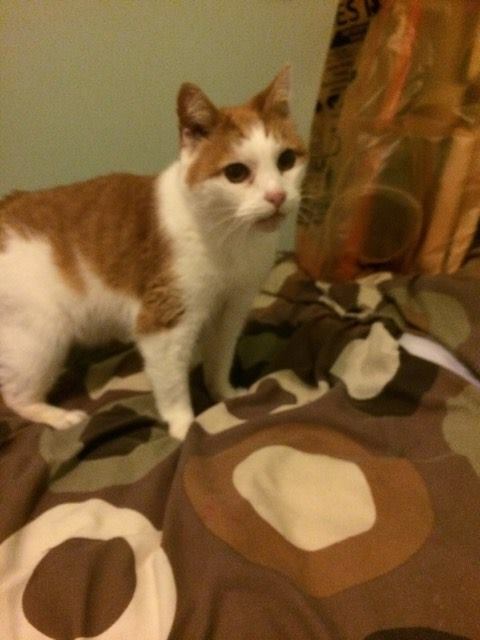 Goldie's Cat Rescue's vet bills are starting to spiral out of control; we need YOUR help! 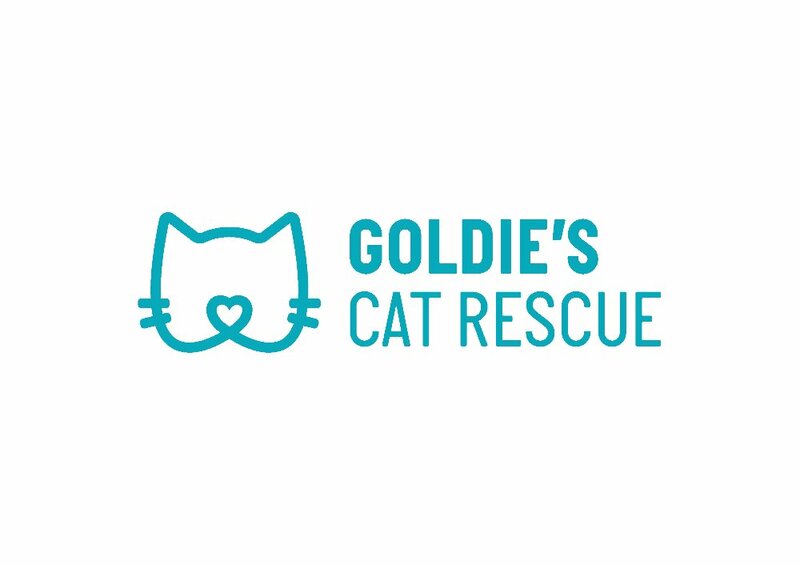 Goldie's Cat Rescue is a non-profit organisation that rescue, rehabilitates and rehomes cats and kittens, giving priority to cats who are 12 years and over, FIV+, or who have long term illnesses, many of which other rescues would normally turn away. We cannot help any more kitties until we at least pay over half of the outstanding amount. 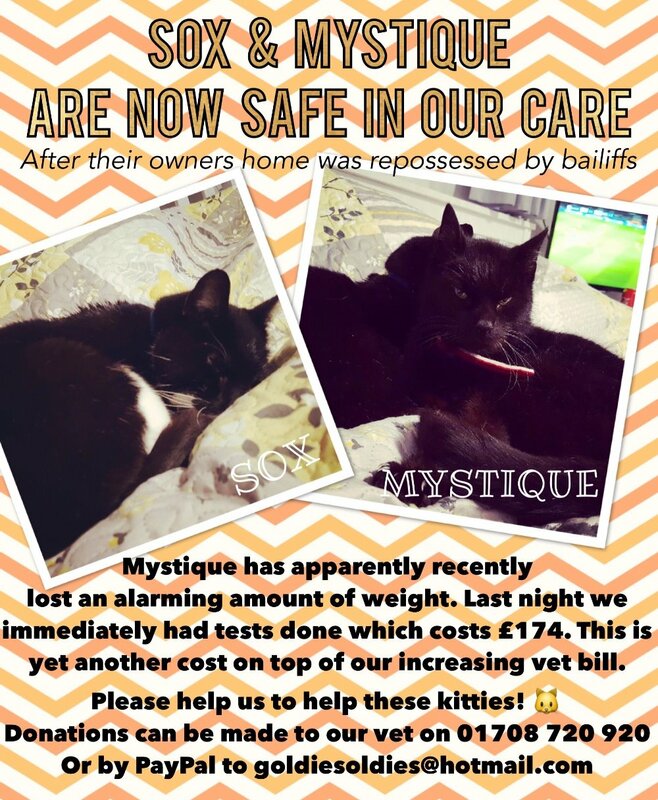 It is currently at £3311, but we have two kitty dentals coming up, which are £200 each, and some other kitties needing their second vaccination. Beau who we took in as a favour to another rescue, was semi feral and hated people... and who wouldnt after a toddler was allowed to constantly torment him and pull his tail, and Beau was physcially repromanded by an adult if he dared to retaliate. It took months and months but finally he learnt that not all humans are bad, and he now has a lovely home with recently married Alison and Todd just outside of London. April came to Goldie's two years ago after her owner passed away. 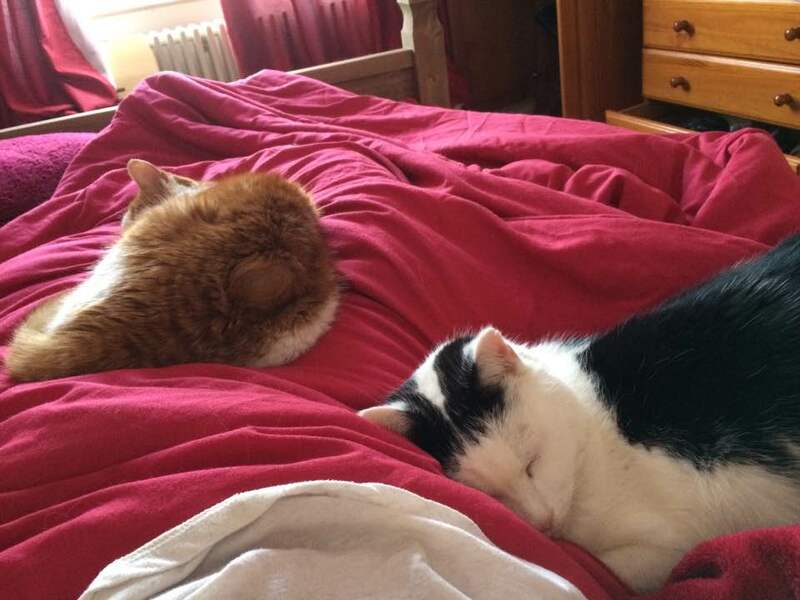 Lovely fosterers Lucy and Jake took care of her until recently, when we found April the most purrrfect forever foster home with an previous adopter Carina. 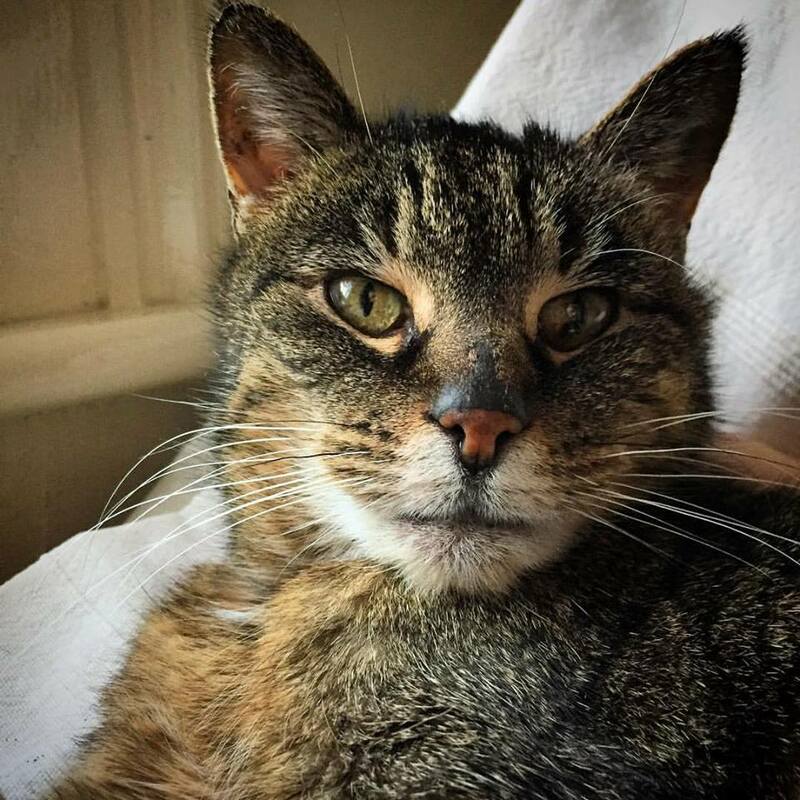 April has many health conditions that may make it difficult for her to find an adopter, so instead we pay for her vet treatment so that her 'forever foster mum' Carina can rest assured and concentrate on giving April the love she truely deserves. Ted is another forever foster kitty who came to us after his owner left her husband, and left her cats behind. 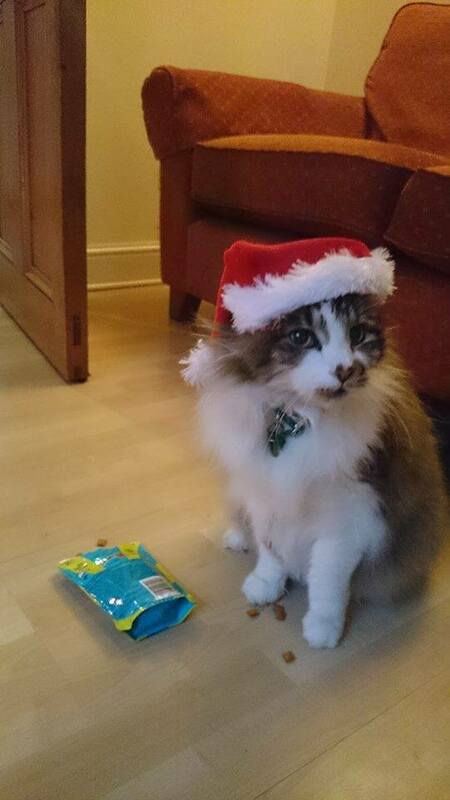 Ted came to us with a cancerous lump, kidney failure and horrible rotten teeth. He is happy at the moment and is loving life, so that is enough for us, and we will do everything we can to make sure he has an amazing last chapter of his life, and of course be there with him when it is 'time'. Again, like April, he now has a forever foster mum, Tracey, but we will pay all of his vet bills. You can see how well he has settled with Tracey and her kitty's below (as well as the cancerous lump on his back). Jetta's owner sadly had to go into a care home, and her daughter didn’t want to keep Jetta herself, so she found herself dumped at a vet practice to be euthanised. Luckily the vet knew that there would be a rescue out there who would be willing to help find Jetta the second forever home she so deserves. Jetta has been with us for a year as we wanted to try and get to the bottom of her upset tummy. After lots and lots of various and different tests, it points to IBS. Her foster mum Rachel has been trying so hard to get Jetta to switch diets and we can see a huge improvement in Jetta and her bathroom habits. 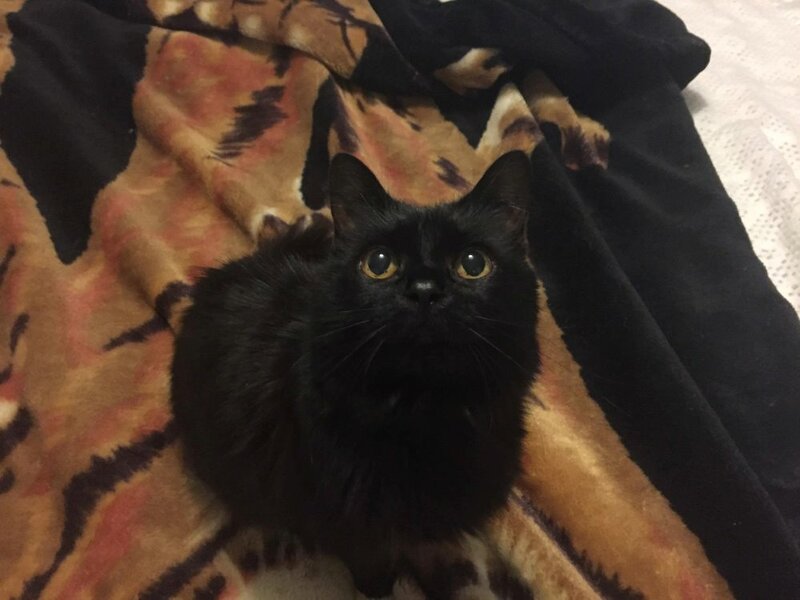 Fingers crossed for Jetta - we may have a potential home for her, but her vet bills are still outstanding. Buffy is a kitty that we are rehoming in what is called 'home-to-home'. 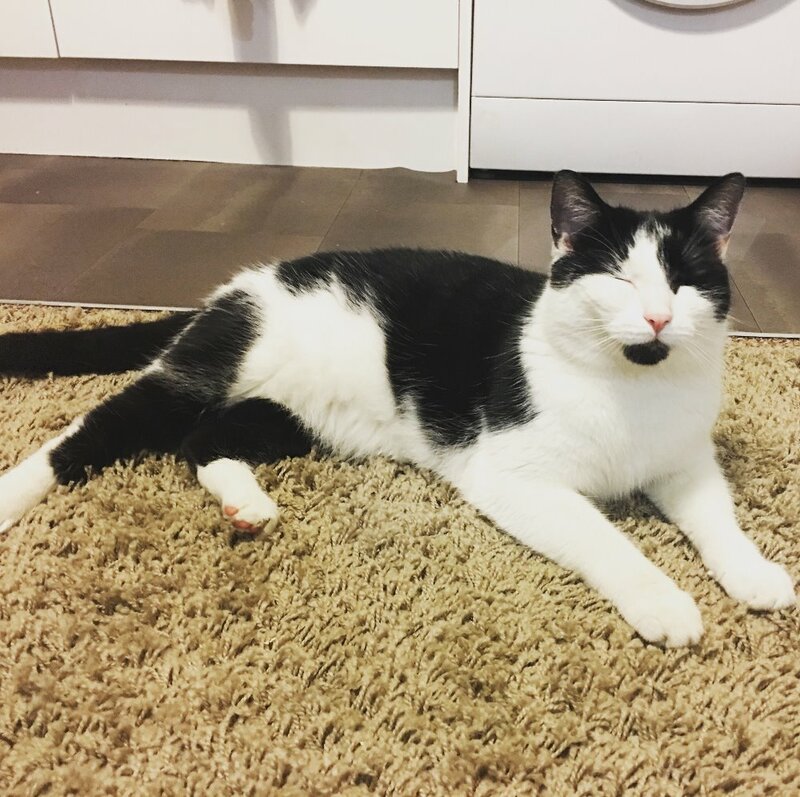 This means that we may not have an available foster home but we get the ball rolling, start their veterinary treatment while they stay with their current owner, and we also start advertising the kitty for adoption. Buffy needed everything - vaccintions, flea treatments, worm treatments, blood tests, urine test, microchipping and a dental. 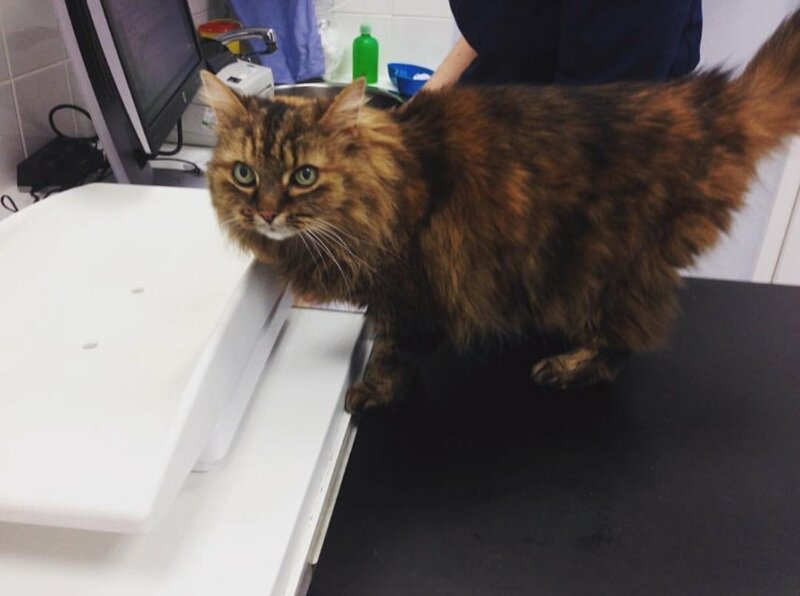 We hopefully have a new home for Buffy very soon on the horizon, but again, her vet bills also need settling before we can help another cat like her. Buffy needs a new home after her owner refused to buy a litter tray for her after the neighbour bought a dog and Buffy, being petrified, refused to go outside. Our fosterer Laura has been transporting her back and forth to the vets to get her ready for the new chapter of her life. 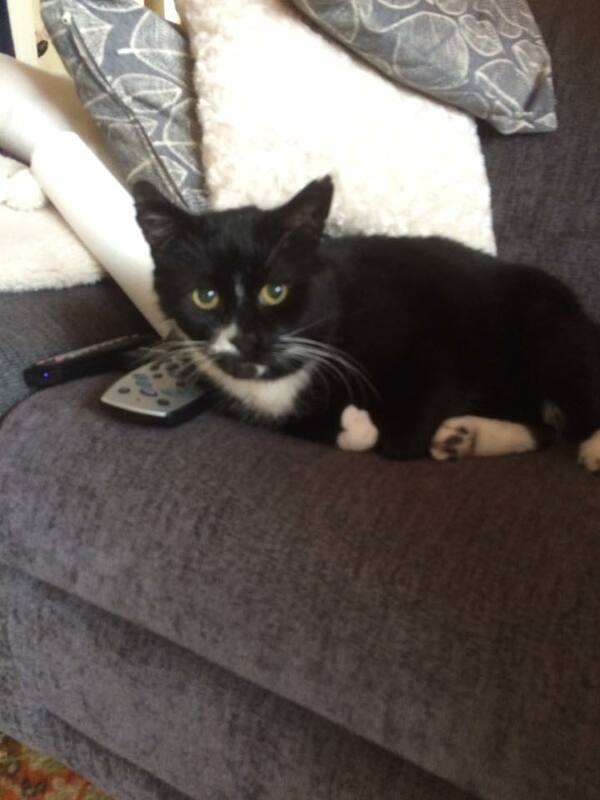 Freddie came to us after his owner moved away and left him behind. The kind neighbour did all she could to help him but sadly her dog was totally against the idea and it was not safe for Freddie to live there, so the kind lady had to lock Freddie in her bathroom. Freddie was very ill when he came to us but with the love and care from his fosterer Tina, he was soon able to find his forever home with Kara. 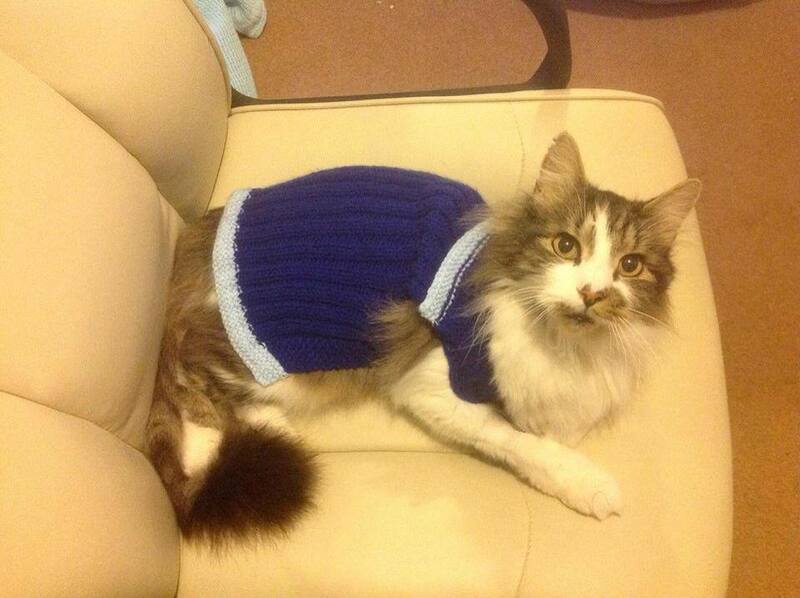 He had a lovely home with Kara for just short of 3 years, where is was loved and even though he had hyperthyroidism, he put on weight! Without your support, and our volunteers, we wouldnt of been able to save Freddie and he wouldnt of had such a lovely last home. The next kitty on our waiting list is Felix. 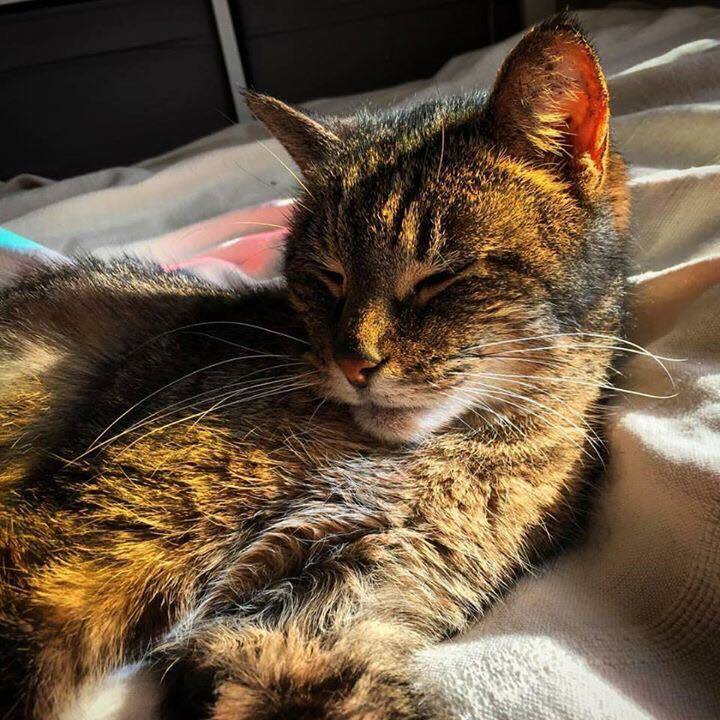 He is 16 years young and his mum has just passed away. The daughter has been advertising on Facebook selling sites, but we contacted her after concerns (that the daughter shares with us) about the safety of his future. We need your help so we can continue, and to find Felix a new home, just how we were able to help all the cats above. PLEASE HELP US TO HELP THESE CATS IN NEED. Thank you every single one of you who has donated so far. We are almost close to the 20% mark! 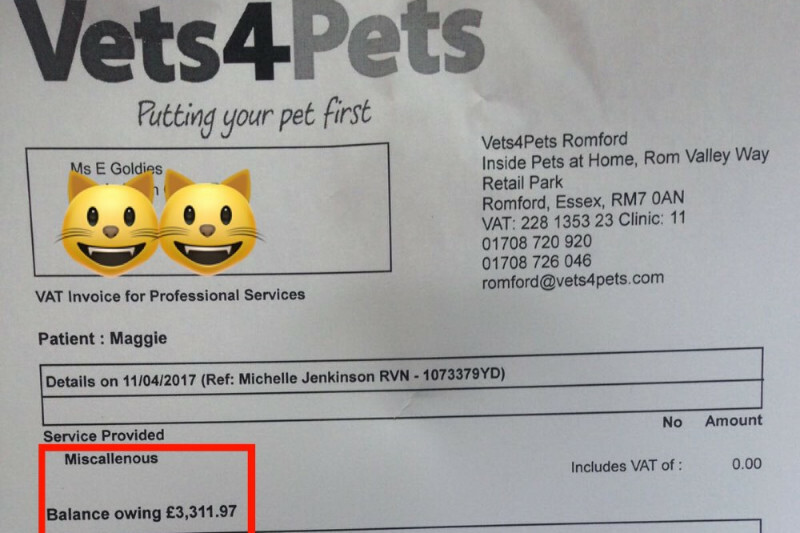 Last night we took in two more cats - which means yet another vet bill, this time another £174. If we didn't take them, then there would of been a risk of euthanasia. Hi, Hope this helps. I so admire what you're doing. I am a cat owner (and lover) and think all cats, especially senior cats, deserve the best. You are doing a good job. Keep it up. Wishing you good luck with your target.